The Loughborough Bellfoundry Trust is pleased to announce that an £8.4m bid to the Heritage Lottery Fund has been made to help secure the long-term future of the last major bellfoundry in Britain, the John Taylor Bellfoundry in Loughborough. 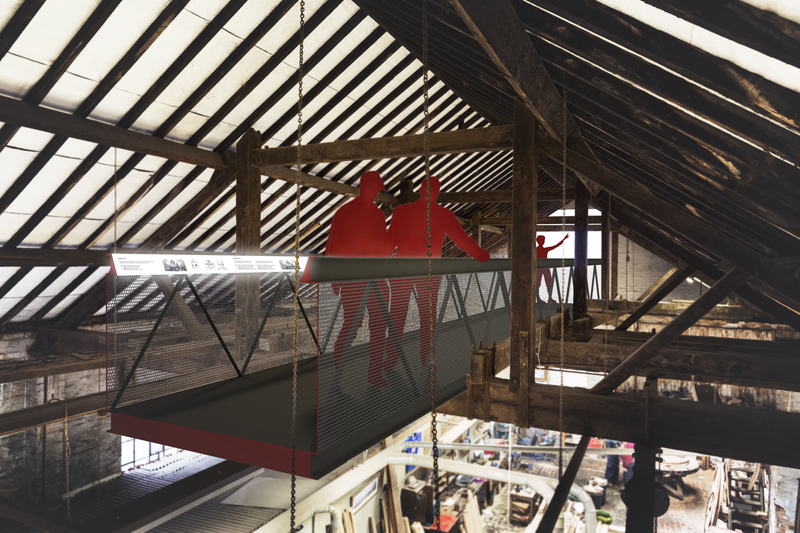 Artist’s impression of the proposed high level walkway, image created by Haverstock. Having been rescued from administration a few years ago, John Taylor & Co. has spent the last few years quietly restoring the fortunes of this historic business and historic factory site. Today, the ubiquitous brand is once again associated with the finest sounding bells in the world and the order book is looking healthy. Based on this platform of stability, in 2016 the Directors established the Loughborough Bellfoundry Trust to hold the site in perpetuity, protect its unique archives, manufacturing methods and tools and prepare a basis for pursuing the comprehensive restoration of the buildings. Since that time, work has been ongoing to prepare restoration proposals that can ensure the long-term survival of Taylor’s as a vital part of our national heritage. Creating a new, accessible, high-level walkway to allow visitors to move around the foundry safely in their own time to observe every stage in the manufacturing process, please see below artist’s impression. Protecting the age-old processes and machinery whilst providing space to explore how 21st century technologies can help Taylor’s to combine centuries of tradition with cutting edge manufacturing techniques. The proposals for the comprehensive restoration of the site were submitted to the Heritage Lottery Fund at the end of 2017. The HLF is currently considering the application before making a decision this spring. As funds from the HLF are heavily competed, the Trust is keen to raise awareness and gather as much support for the project as possible in order to save the last major bellfoundry in Britain and the only Victorian bellfoundry in the world. If you would like to support the project please follow our facebook page or twitter feed (Twitter: @Lborobelltrust, Facebook: facebook.com/lborobelltrust). Artist’s impression of the new extension to the existing foundry. Courtesy of Haverstock. What is the Loughborough Bellfoundry Trust and why has it been set up? The Loughborough Bellfoundry Trust is a Charitable Incorporated Organisation, registered with the Charity Commission in 2016. It was set up by a number of the John Taylor’s & Co directors to safeguard the future of bell making at the site in Loughborough in perpetuity. The unique collection of buildings, equipment, patterns, machinery and archives from the Bellfoundry have been transferred into the charitable trust to ensure their long-term protection for the nation. What is the relationship between the Trust and the John Taylor’s & Co business? In 2009 a group of likeminded bell-ringers set up UK Bellfoundries Limited (UKBL) to purchase the site and business at Loughborough as a going concern. The previous business, Taylor’s Eayre and Smith, had gone in to administration and there was the potential for the site, collections and assets to be broken up and lost. From 2009 to 2015, UKBL focused on restoring brand value, improving the quality of product, increasing the pipeline of work and the efficiency of the business. In 2015 UKBL, having ensured the business was on a firmer footing, started to focus on the future of the Bellfoundry, particularly the buildings which are in a poor state of repair and the important collections they house. In 2016 the Loughborough Bellfoundry Trust was established and the buildings and collections were transferred to the Trust to ensure their long-term protection for the nation. Several the Loughborough Bellfoundry Trust trustees are also John Taylor & Co directors. The Trust is responsible for the buildings and collections at the site in Loughborough. Through the formation of the Trust and transfer of assets John Taylor & Co business is now a tenant of the Trust. Will this impact upon the way that John Taylor & Co does business? Nothing will change on the ground at Taylors, the company will continue to trade albeit as a tenant of the Trust and with greater certainty about the long-term survival of the property and collections. Why are the buildings so special? The earliest. buildings that make up Taylors Bell Foundry date from 1859 and have been developed and changed as the business grew and following a fire in 1891. They are Grade II* Listed and this means that they are in the top 8% most significant historic buildings in the UK from a total of around 380,000 Listed buildings (92% are Grade II Listed and 2.5% are Grade I). It is the only purpose built Victorian bell foundry in the UK and we are pretty sure, in the world, with many areas of interest in architectural and constructional detail. The buildings are currently on the Historic England (HE) ‘Heritage At Risk Register’ which is a ‘programme which identifies those sites that are most at risk of being lost as a result of neglect, decay or inappropriate development’ (Historic England 2017). In the case of the bellfoundry, it falls within the ‘decay’ category. The Trust and John Taylor & Co have worked closely with HE to identify the most urgent repairs and have secured two HE grants to deliver a series of repairs over 2016 and 2017. Although these repairs have already had a positive impact on the buildings, further repair is required to ensure the building can be taken off the Heritage At Risk Register and given a new lease of life. What is the ‘Saving the Last Major Bellfoundry in Britain’ project? Our vision is for the John Taylor Bellfoundry to become the global centre in the art of bell making and learning. The sound of Taylor bells can be heard all over the planet; our vision is to secure this legacy and make sure future generations on every continent can be brought together by A Ring of Taylor Bells. 1: Conservation: The project will secure the conservation and enhancement of the Grade II* Listed John Taylor Bellfoundry. It will sensitively repair the Victorian bellfoundry and protect its unique collection of artefacts and archive and facilitate the conservation of historic bells and bell-towers throughout the world. 2: Education: The project will advance education in the history and art of bell making and bell ringing for people of all ages and levels of experience. It will ensure that the unique skills that go into bellfounding are preserved by training future craftsmen and women and enable public access to the world’s most significant archive of bell material. 3: Bellfounding: The project will enable Taylors to become the preeminent centre for bell research, development and manufacturing. It will ensure that processes pioneered by Taylors over centuries are sustained whilst exploring how 21st century technology can add value to this timeless art. 4: Celebration: The project will excite unprecedented numbers of visitors to the site and engage them in its history. It will engage new audiences and help communities to celebrate the heritage of bells across the UK and around the world. 5: Resilience: The project will ensure that the bellfoundry is financially sustainable and maintained into the long-term, ensuring bellfounding in the UK continues for future generations. How long will it take to deliver the project? To secure the funds, restore the buildings, create an improved visitor experience and safeguard the collections will take time. The process to securing funds from the Heritage Lottery often takes 2-3 years and we anticipate that, if successful with the funding bid, we are unlikely to start on site until 2021. Although the preparation of these bids and securing match funding will take time, much necessary feasibility work and designs will be prepared during this time and we believe that this is the best possible route to ensuring the long-term future of the buildings and collections.